Not only is Grootfontein one of the biggest agricultural and business towns in Namibia, it also has a lot to offer in terms of tourism. With homely B&B’s and a rich history, the town serves as a great stop over point before heading out into the wildness of Bushmanland. Its Damara/Nama name of Gei-/ous, like the Afrikaans one, means "Great Spring". 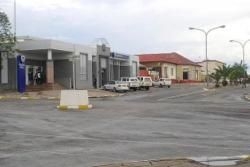 Grootfontein was officially proclaimed a town in 1907 and is today a fully-fledged town with local industries producing meat, dairy products, sorghum, peanuts, sunflowers and leather goods.